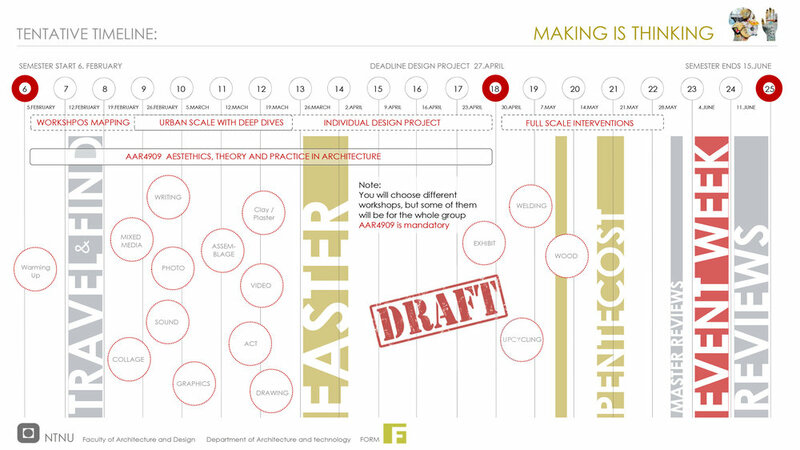 The Making Is Thinking master studio course is a pilot project of the TRANSark research centre at the Faculty of Architecture and Design at NTNU and represents part of a much-needed investigation into the development of skills connecting body and mind. The course assignments range from full-scale building to 'hands-on' experiences and artistic methods. Central to the course is ‘lateral thinking’, which challenges students to overcome learning thresholds. The traditional design studio cannot mimic the embodied experience that is achieved through by the comparatively real experience of making. The hands-on making and its sometimes unexpected outcomes lead to the students challenging habitual and preconceived notions (‘design fixations’ or ‘Einstellung effects’) they may have concerning what an architect does, or should do. In order to take more conscious positions, the students are trained to discuss their learning processes as well as to communicate their work to non-architects, gaining knowledge that not only covers professional and academic skills, but also contextualises tacit knowledge. Making is Thinking was also in 2018 initiating the event Hendelser på Nyhavna together with Cirka teater, Trondheim municipalities and Trondheim harbour authorities. We transformed a former car repair shop in to a participatory exhibition where the students also presented their ideas for Nyhavna. Outside the students made a multifunctional physical intervention: Partly stairs, stage, tribune and simply something interesting to look at or climb in. It advertises the upcoming new entrance for Cirka teater and is made of reused materials. During the spring semester 2016, 14 Master students followed the Masters course Making Is Thinking. The semester is characterised by a collaboration with the theatre company Cirka Teater and Trondheim’s city planning office. This was a collaboration aiming to contribute to the local debate about the future of the harbour area Nyhavna in Trondheim. The Making Is Thinking students put forward their arguments through drawings, models, performances, and full-scale interventions presented at a public festival called “Hendelser På Nyhavna”.